We’d love your help. Let us know what’s wrong with this preview of Red Rider Revolution by Randall Allen Dunn. To ask other readers questions about Red Rider Revolution, please sign up. Did not disappoint me. Picked up where book 1 left off and continued to keep my attention. Red will have you going through emotions with her. Do yourself a favor, read these books. Paranormal retellings of Red Riding Hood are not uncommon. Seriously- what better way to throw some action into the classic story of girl versus wolf than to make that grandma-eating-wolf a monstrous werewolf? Red Rider Revolution is a story of courage, identity, and battling the lies in our lives with truths from the Bible. That’s right, Red Rider Revolution is a Christian paranorma I received this book from the author for the purpose of this review. All comments and opinions are entirely my own. Red Rider Revolution is a story of courage, identity, and battling the lies in our lives with truths from the Bible. That’s right, Red Rider Revolution is a Christian paranormal, which I, admittedly, was incredibly hesitant to take a gander at. Paranormal has always been on my taboo list so I couldn’t imagine how it could be a Christian novel, but my curiosity got the best of me and I read it. And boy am I glad I did! Different from the (very few) paranormals that I’ve read, Red Rider Revolution leans more towards a Spiritual Warfare battle than it does a general monster thriller. I’m not going to describe how to keep spoilers out of the review, but I was actually impressed with how the werewolves were handled and the amount of Christian morals and illustrations that were present. Now, that’s not to say that the wolves weren’t scary and there was no action; quite the contrary in fact. The graphics and action in this novel is incredibly high, with very detailed scenes of torture, deaths, and rituals. The emotional stress should also be taken into consideration before reading. But aside from this, there is no profanity and the only “sexual” content is a few detailed kisses (and vague mentions of the werewolves being naked as they transform from human to wolf). My only complaint about this book would be that it is very long. Once the height of the action started, it seemed like it didn’t slow down or stop for a breather once. There were several fight scenes that could have ended the book instead of continuing to drag it on and I actually caught myself a little bored in the action just because there was so much happening back to back and I couldn’t see the end. 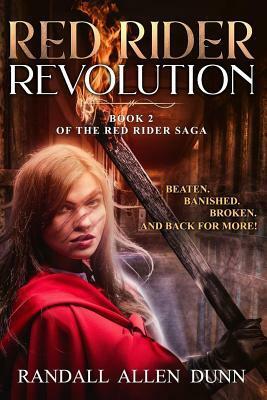 But overall, I was pleased with Red Rider Revolution and cannot wait for book 3! I give it 4 out of 5 stars and challenge you to take a chance on this Christian paranormal (if you do, come back and let me know your thoughts!). -Note: This is book 2 and does pick up where book 1 left off, but I had not read the first book and could follow the story perfectly. Randall Allen Dunn was raised on a steady diet of James Bond, Batman, Star Trek and Indiana Jones. He writes stories of action, adventure, and infinite possibility, as well as instructional books about writing. You can follow him on Facebook, Twitter, Pinterest, Goodreads and YouTube, and follow his Packing Action blog at www.RandallAllenDunn.com. Please send comments or feedback to: Randall@Randall Randall Allen Dunn was raised on a steady diet of James Bond, Batman, Star Trek and Indiana Jones. He writes stories of action, adventure, and infinite possibility, as well as instructional books about writing.